1998 - HAPPY SIXTIETH ANNIVERSARY SUPERMAN! 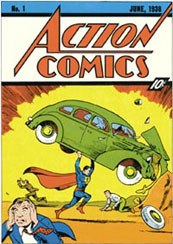 Superman's first appearance was sixty years ago in April, 1938 - in Action Comics #1 with a cover date of June, 1938. 1998 also coincides with the Twentieth Anniversary of 1978's Superman: The Movie, starring Christopher Reeve. As part of Warner Brothers' 75th anniversary celebration, the movie is scheduled to be re-released to select movie theaters beginning in April. There will only be one showing at each theater. This will be the first time since 1978 that the original cut of this movie has been made available! Warner Aspect has released Elliot S! Maggin's Kingdom Come novel, based on Mark Waid and Alex Ross's groundbreaking mini-series. This story relates the events surrounding Superman's return to Earth in its darkest hour. The history of Superman's multi-media incarnations from 1938 to 1978! 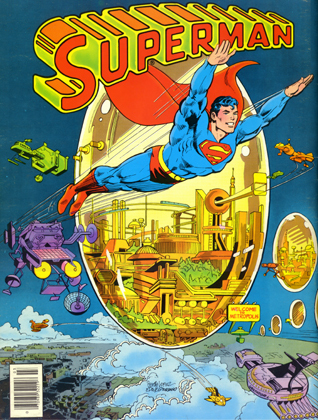 Metropolis, Illinois held its annual Superman Celebration from June 11 to June 14, 1998.